On the 1st (Mon), wander the streets of Worth Avenue and then browse the different shops at CityPlace. To see where to stay, more things to do, other places to visit, and tourist information, refer to the West Palm Beach journey planner. Washington DC to West Palm Beach is an approximately 4.5-hour combination of flight and bus. You can also do a combination of train, flight, and bus; or drive. In April, West Palm Beach is a bit warmer than Washington DC - with highs of 84°F and lows of 69°F. Finish your sightseeing early on the 1st (Mon) to allow enough time to drive to Miami. Head to Lincoln Road and Ocean Drivefor some retail therapy. You'll get in some beach time at South Beach and Hollywood Beach. And it doesn't end there: shop like a local with Aventura Mall, wander the streets of Collins Avenue, admire the striking features of Freedom Tower, and buy something for everyone on your list at Village of Merrick Park. To see traveler tips, reviews, photos, and other tourist information, use the Miami journey site . Getting from West Palm Beach to Miami by car takes about 1.5 hours. Other options: take a bus; or take a train. In April in Miami, expect temperatures between 85°F during the day and 71°F at night. Finish your sightseeing early on the 4th (Thu) to allow enough time to drive to Key Biscayne. Key Biscayne is an island located in Miami-Dade County, Florida, United States, between the Atlantic Ocean and Biscayne Bay. On the 5th (Fri), tour the pleasant surroundings at Crandon Park Beach, then visit a coastal fixture at Cape Florida Lighthouse, and then enjoy the sea views from Bill Baggs Cape Florida State Park. To find maps, more things to do, photos, and other tourist information, read our Key Biscayne trip itinerary maker tool . Key Biscayne is just a short distance from Miami. In April, daily temperatures in Key Biscayne can reach 85°F, while at night they dip to 71°F. Finish your sightseeing early on the 5th (Fri) so you can drive to Key Largo. Step out of the city life by going to Florida Keys Wild Bird Rehabilitation Center and Parasailing & Paragliding. Discover out-of-the-way places like Molasses Reef and Key Largo Watersports. Spend the 7th (Sun) on the water with a fishing tour. And it doesn't end there: explore and take pictures at Spiegel Grove, get some thrills out on the water with a waterskiing or jet-skiing adventure, stop by Robert Is Here, and revel in the low prices at Sandal Factory Outlet. For more things to do, where to stay, photos, and tourist information, read Key Largo day trip planning site . Traveling by car from Key Biscayne to Key Largo takes 1.5 hours. April in Key Largo sees daily highs of 83°F and lows of 69°F at night. Wrap up your sightseeing on the 9th (Tue) to allow time to drive to Islamorada. For shopping fun, head to Bella Sol Fragrance Bar and Gifts or Gallery Morada. Discover out-of-the-way places like Scuba & Snorkeling and Parasailing & Paragliding. And it doesn't end there: tour the water at your own pace with A1A Watersports, get a new perspective on things with Spray Watersports, take a memorable tour with Bayside Boat Rentals, and take in the exciting artwork at Old Road Gallery. To find maps and tourist information, refer to the Islamorada holiday builder site . Traveling by car from Key Largo to Islamorada takes an hour. Alternatively, you can do a combination of taxi and bus. Expect somewhat warmer evenings in Islamorada when traveling from Key Largo in April, with lows around 75°F. Cap off your sightseeing on the 14th (Sun) early enough to go by car to Marathon. Relax by the water at Sunset Park Beach and Sombrero Beach. 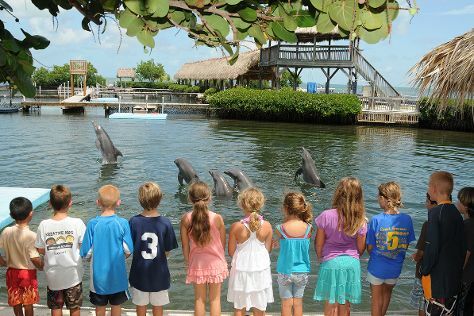 Get in touch with nature at Dolphin Research Center and Crane Point Museum & Nature Center. The adventure continues: add some adventure to your tour with a kayaking and canoeing tour, choose your vessel at Island Time Boat Rental, see the vivid underwater world at Sombrero Reef, and relax and rejuvenate at some of the top local wellness centers. For where to stay, reviews, ratings, and other tourist information, read Marathon online tour itinerary planner . You can drive from Islamorada to Marathon in an hour. Another option is to take a bus. In April in Marathon, expect temperatures between 86°F during the day and 75°F at night. Finish your sightseeing early on the 18th (Thu) so you can take a bus to Big Pine Key. Big Pine Key is a census-designated place and unincorporated community in Monroe County, Florida, United States, on an island of the same name in the Florida Keys. Kick off your visit on the 19th (Fri): glide peacefully along the water with some of the best stand-up paddleboarding in the area, admire the majestic nature at Bahia Honda State Park, and then make a trip to Adolphus Busch. Get ready for a full day of sightseeing on the 20th (Sat): take in the exciting artwork at Artists in Paradise Gallery, see what you can catch with a fishing tour, and then stop by Out of the Blue Gallery. Plan a Big Pine Key trip in moments using our itinerary builder. Big Pine Key is just a stone's throw from Marathon. April in Big Pine Key sees daily highs of 86°F and lows of 75°F at night. Wrap up your sightseeing on the 20th (Sat) early enough to take a bus to Key West. Shop till you drop at Uva Wine Shop & Bar and Key West Pottery. Get outdoors at Kayaking & Canoeing and Key West Butterfly & Nature Conservatory. Spend the 24th (Wed) exploring nature at Dry Tortugas National Park. There's lots more to do: find your balance on the water with some of the best stand-up paddleboarding in the area, relax and rejuvenate at some of the top local wellness centers, glide through the air with a parasailing or paragliding tour, and make a trip to Mallory Square. To see reviews, traveler tips, more things to do, and tourist information, use the Key West trip planning site . Take a bus from Big Pine Key to Key West in an hour. Alternatively, you can drive. In April in Key West, expect temperatures between 83°F during the day and 74°F at night. Wrap up your sightseeing on the 27th (Sat) to allow time to travel back home.